Microsoft has finally released the official Bing app for the iPhone platform. This is infact the third app which has come out of Microsoft for the iPhone platform, the two other being Seadragon Mobile and Microsoft Tag for iPhone. Bing app is also available for Windows Mobile and RIM BlackBerry devices. Bing for iPhone and iPod touch is a neat little app which includes features such as standard search, voice search, maps with directions, ‘locate me’ feature and local searches for Movies and restaurants. The app will also change the background image daily, just like the Bing.com homepage does. For sure Microsoft has realized the importance of the increasing market share which the iPhone platform currently posses and they simply cant ignore the platform and give it all away to Google. Even though the software giant hasn’t announced any such plans for Android yet, we still might see an iPhone app for the Android platform some time later this year. Bing App for iPhone and iPod touch is available for free on the iTunes App Store. You can download it today through the link given below. 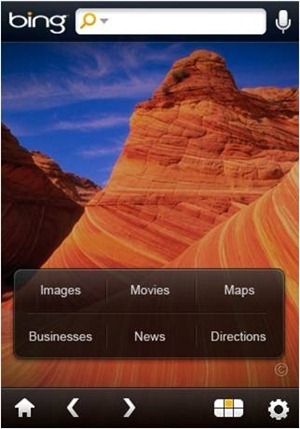 Check out our iPhone Apps Gallery to explore more apps for your iPhone or iPod touch. Wow – Way to go Bing! Things are getting better – Hopefully, the next update will focus more on better search algorithm and more accurate results..